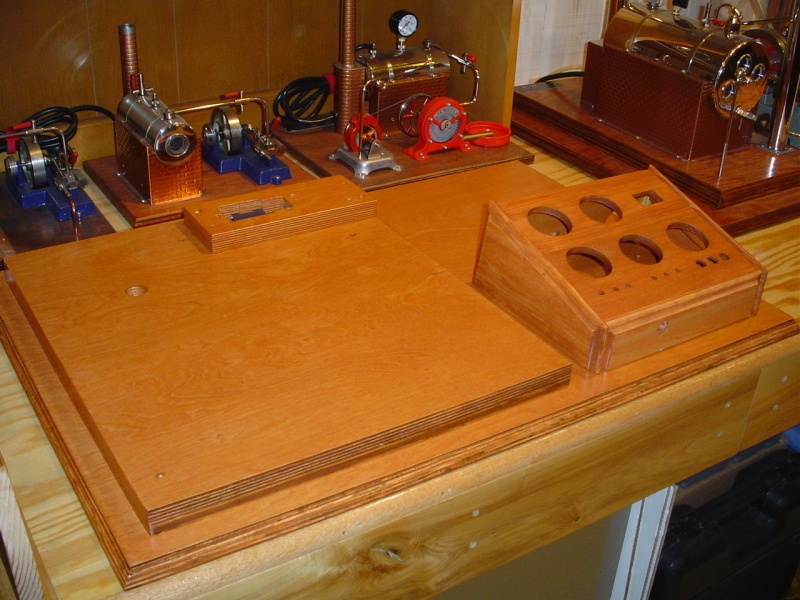 A Jensen 51 is supported by a large expanse of wood consisting of a Jensen 50's wood base attached to the top of a much larger base allowing for the water tower and control console. 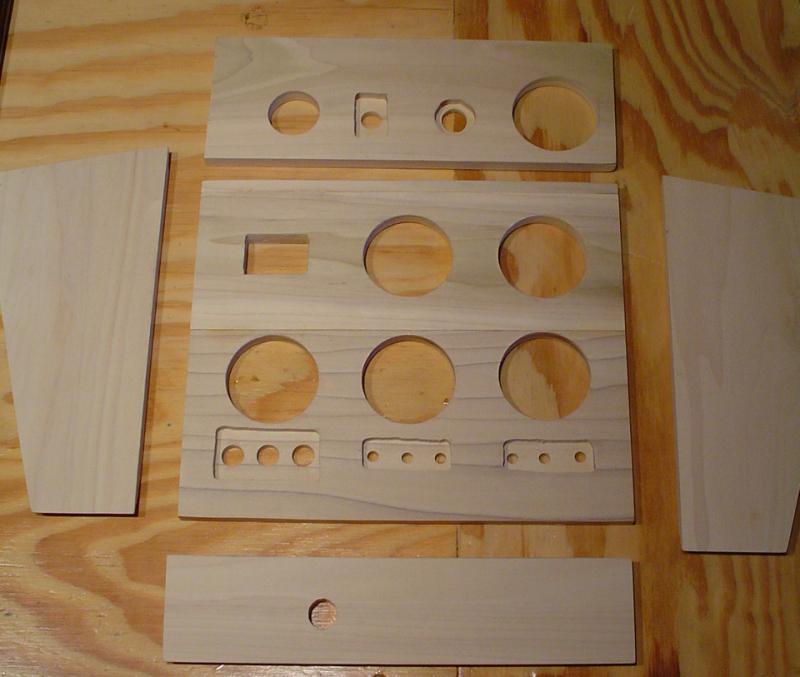 I opted to use 100% new wood for this effort, the original Jensen 50 base will be retained by the new owner. 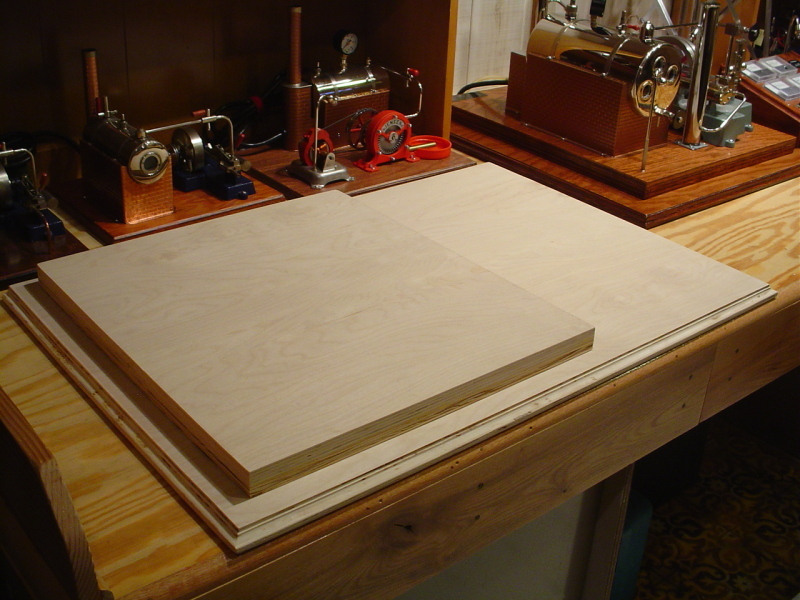 3/4 inch cabinet grade birch plywood was used for the large base. 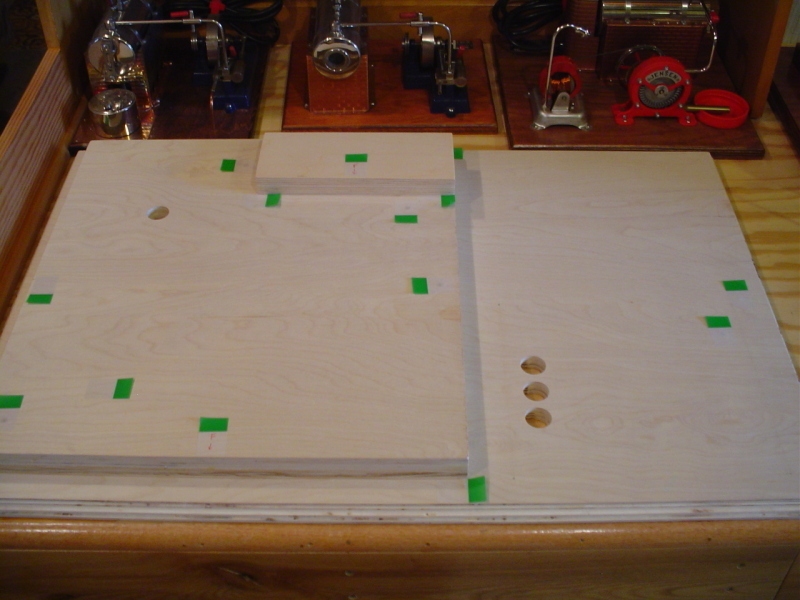 The Jensen 50's pedestal was made up of a 3/4 inch thick piece of this same plywood glued to a 1/2 inch thick piece of plywood, to form 1 1/4" total thickness, same as originals. Here is the engine pedestal being glued together prior to final edge sanding to size. 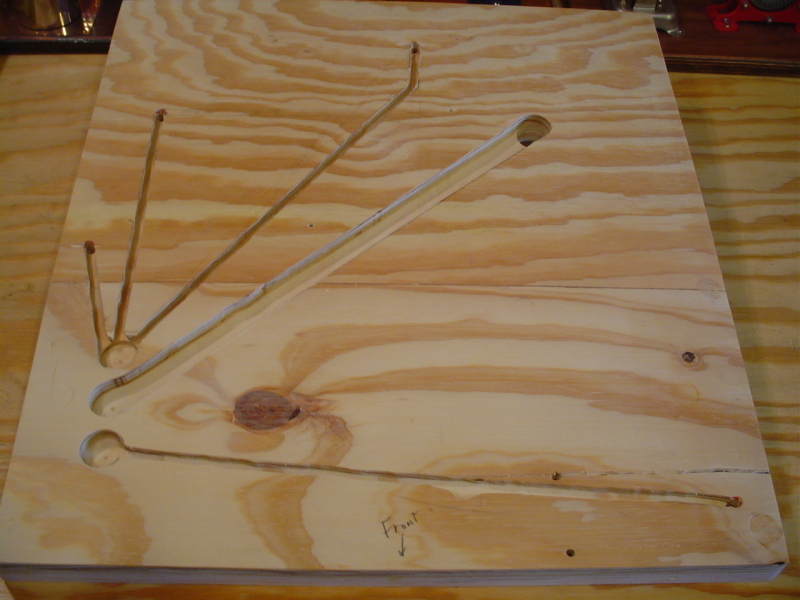 Once the engine pedestal was dry, and edge sanded...the main base was routered on the edges and sanded. I have been messing with the wood on and off for two weeks now, cutting to size, routering edges and routering the concealed channels beneath for passing wiring between engine, lights and motor on the left side to and from the console on the right side. First...the main engine pedestal gets routered on the underside, allowing the lights, motors and generator leads to culminate in 3 large holes that then line up with 3 matching holes in the main base allowing the wires to pass concealed to the console. 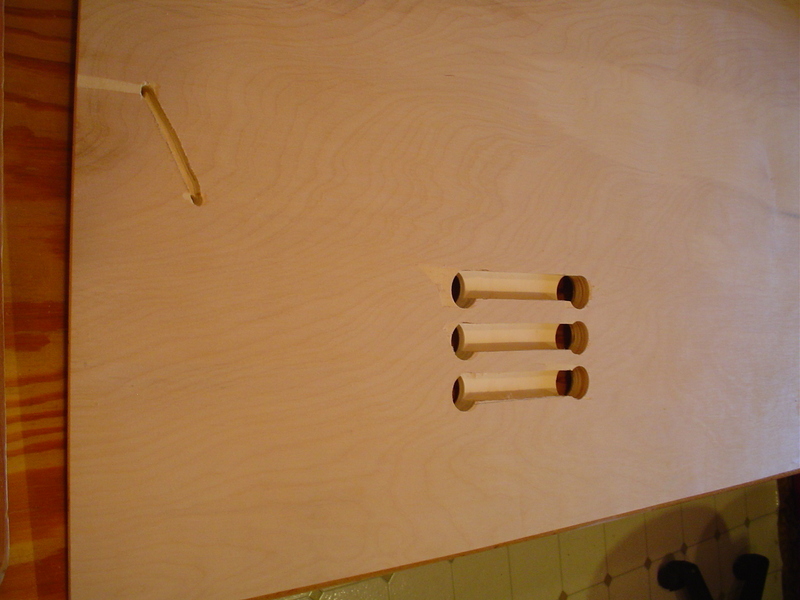 The series of 3 holes side by side in the main base create a channel beneath the visible surface of the base which comes up inside the console. When completed, a thin plate will protect and conceal this 4" x 6" section of wiring beneath the main base (visible only if you flipped the works upside down). Trial sizing of engine pedestal on the main base making sure the channels beneath line up where they need to be. The three holes still visible right front are covered up by the console and all wiring passes thru them. 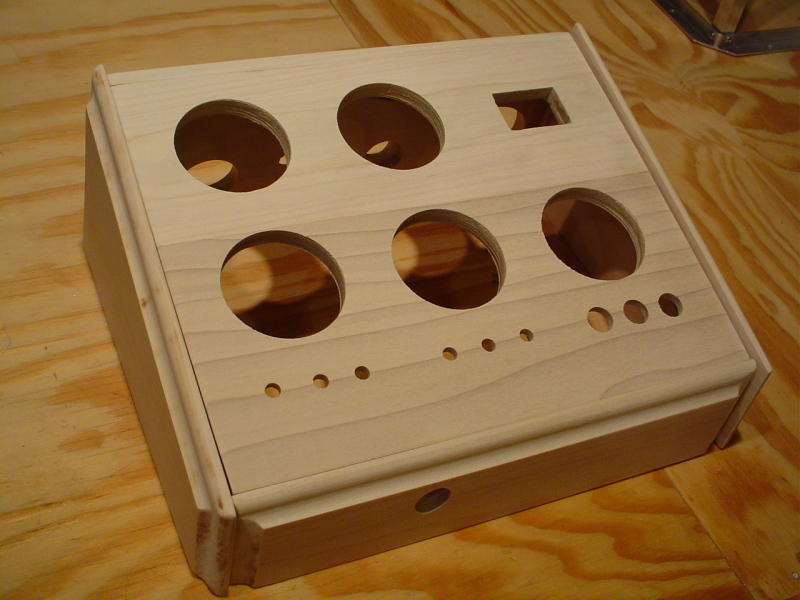 The toughest piece of woodworking to get right is the console itself. It might not look like much, but it has a total of 20 holes cut in the cover, back and front for the various switches, gauges, pilot light, fuse holder, ventilation fan etc. etc. That cover took three separate attempts to get it right (and I've done it before!!!). It's perfect now but I shot most of the day getting it that way...must remember...measure twice, cut once! 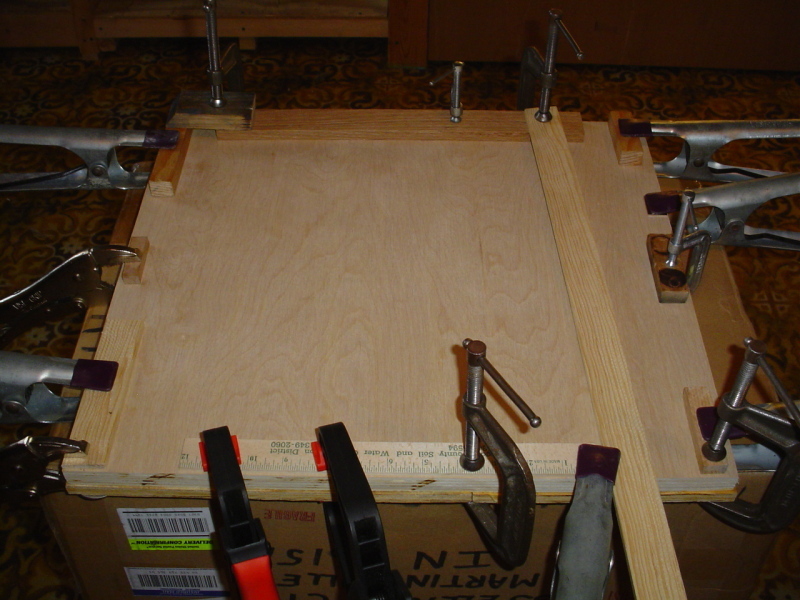 Small victory...the console is loosely assembled here, gluing and awaiting staining step. All the switches, gauges etc. fit...Eureka ! Woodworking is now complete...2 coats of stain and 4 coats of semi-gloss polyurethane lightly sanded between coats. I'm happy with the outcome.